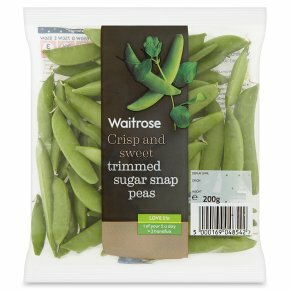 Crisp and sweet trimmed sugar snap peas, ideal for Asian curries, stir-fries and summer salads. Microwave ovens vary: refer to handbook. Place on a microwaveable dish with 2-3 tbsp. of water, cover and cook on full power. After cooking allow to stand for 1-2 minutes. Check food is piping hot throughout. if not, heat for a further brief period.